So I have to admit, I’ve been neglecting this episode’s recipes because we’re not big fish fans and I’m not very experienced in cooking fish. At last, I have decided to face this challenge head on and get it over with. I have one more recipe left from this episode and I promise to do it next week so we can all move on, because there’s a lot of Good Eats episodes left, and I’m not getting any younger. Heat a heavy pan over medium high heat. Season fish on meat side with salt and pepper. Lightly dredge fish in flour and shake off excess. When pan is good and hot, add Canola oil followed immediately by 1 tablespoon butter. As soon as foaming subsides, place fish in pan with the skin side down. Jiggle pan for the first 10 seconds to keep the fish from sticking. Cook until golden crust forms on meat. 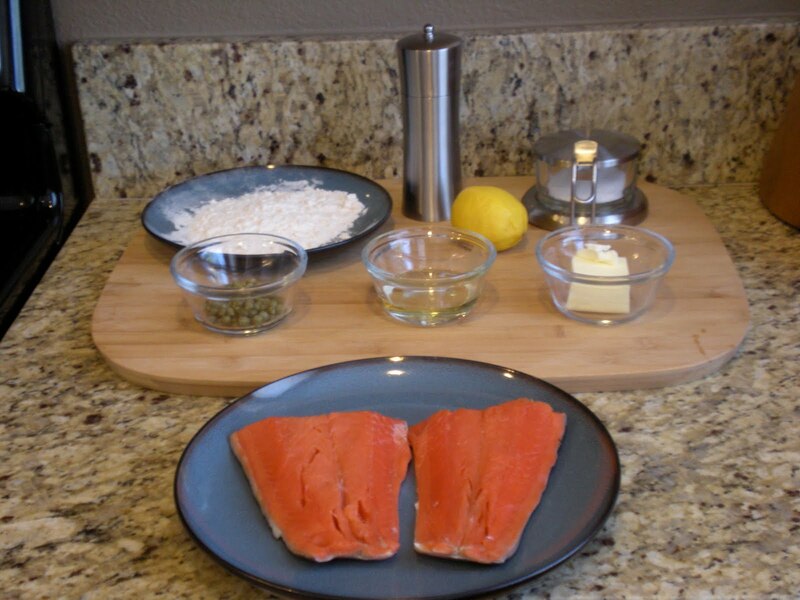 Carefully turn fish away from you and again jiggle pan for the first few seconds. Cook until skin turns golden brown. Remove to a warm plate. 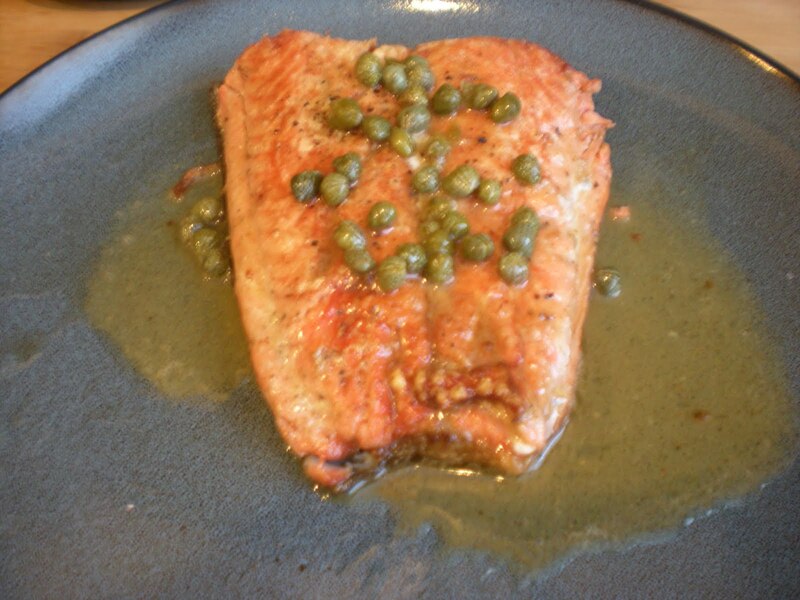 Pour out the cooking fat, add remaining butter and quickly fry the capers. Remove pan from the heat, add lemon juice to pan and swirl. Pour sauce over the fish and serve. 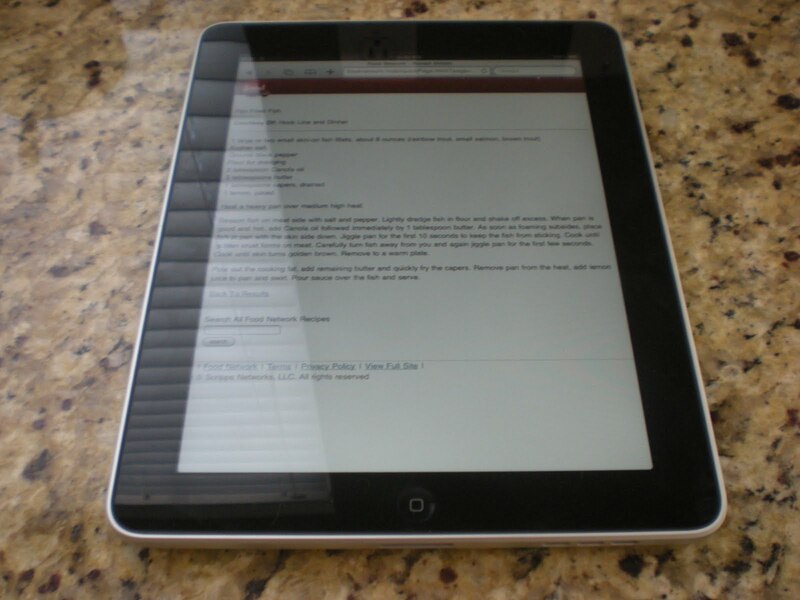 The recipe on my brand new iPad! All in all this recipe is very easy and pretty much fool proof. The salmon did not have a fishy taste at all, which I was very impressed with. I did make sure that I purchased fresh caught and not farm raised salmon. Remember when buying any fish, always ask to smell it. It should never smell “fishy” in fact it shouldn’t smell like anything at all. Not enough people ask to smell their fish before they purchase it. Be not afraid, I promise you the person behind the counter will appreciate it. Usually the thought of pan frying fish leaves me cringing, stinking up the whole house with the smell of fried fish, not the most inviting scent. I was actually surprised that after making this dish there was no lingering odor…HOORAY! We both enjoyed this recipe and would probably make it again. Definitely a Good Eats fish dish, and coming from us, that’s saying a lot!